What you need to know about table salt vs sea salt. You may have heard “sea salt” is better for you than table salt. Well, that’s really only half of the story. There’s something else missing in most salts…even some of those who call themselves “sea salt.” And in fact, most of the so-called “sea salt” out there is just as bad for you as table salt! Most of the big salt brands you see in the store are refined. (And they taste like it too!) What does that mean? 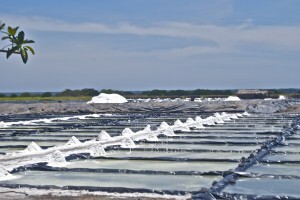 When salt goes through the refining process all of the minerals and moisture are stripped away. Then sulfuric acid and chlorine are used to bleach table salt white. Refined salt is processed so much it has an impossibly high, 99.7%, “purity”. Doesn’t sound very good…does it? Well, it’s not good. (Did you notice the poison “cyanide” and the chemical people clean with, “ammonia”?) Why do the big name salt makers do this? What’s more — the FDA allows content of up to 2% anti-caking agents for table salt… citing free-flowing salt as the upside of all those toxins! The worst part is — some of big name salt makers have caught on to America’s “health craze” and started adding the “sea salt” label to their boxes. But it’s all just a marketing ploy. While commercial “sea salt” may in fact come from the sea…it’s also highly likely to be subjected to the harsh, toxic, mineral-stripping refining process before it ever reaches the shelves! Now, you may also be wondering — what’s wrong with 99.7% “purity?” Isn’t that a good thing? That’s something else I discovered. When salt is stripped of its minerals…your body doesn’t “get it.” Refined salt is essentially toxic without its trace minerals. It’s unnatural. So our bodies treat it like a foreign substance. Our bodies don’t know how to use it properly. So if our body needs salt to live…but table salt, commercial “sea salt” and even koshering salt all have toxins in them…what’s left? We go back to how salt was made 150 years ago — before industry turned it into just another processed chemical. That’s why we created AztecSeaSalt™. A hand harvested, artisanal sea salt with all the natural trace minerals you want and your body needs and none of toxicity of anti-caking agents. AztecSeaSalt™ is not sold in stores. Due to the 16 week harvest and micro batches, all orders are limited to just 4 bags. Modern packaging for traditional salt, the 8 oz bag has a built-in salt cellar with a zip-top closure. This is the best tasting sea salt you have ever tried and it has a lifetime, no questions asked, money-back guarantee to back that up. Want a free bag of salt? Quick, before they are sold out. Is Sea Salt Healthy, Can Refined Salt Kill You? This entry was posted in Health and tagged Salt, Sea salt, table salt vs sea salt by john. Bookmark the permalink.